Within the amalgam of tourist places that the Baños de Agua Santa canton offers its visitors, one has become a mandatory stop in the itinerary of the thousands of people who visit it year after year. It is the fascinating and charming Tree House, a small wooden building mounted on a giant tree. 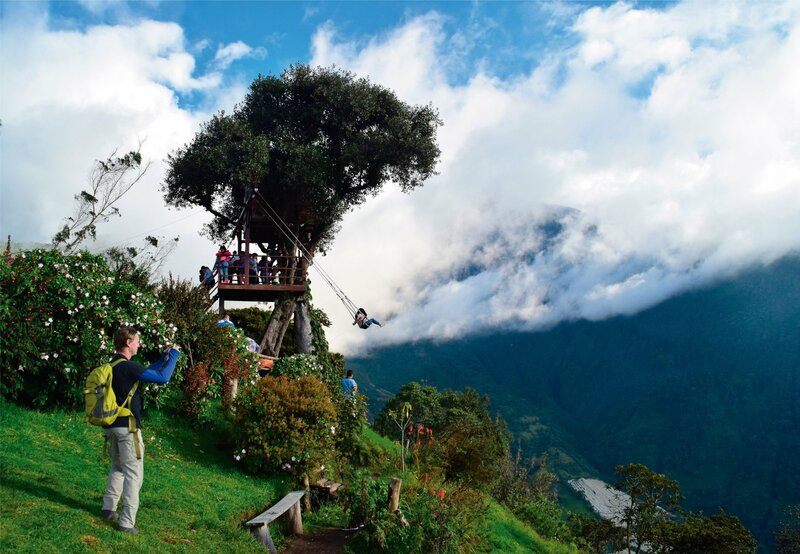 Considered one of the best places to observe the Tungurahua Volcano is without a doubt the Tree House in Baños Ecuador, located in the Runtún farmhouse at 2660 meters above sea level. You can visit with family or friends if you are a lover of landscaping and incredible places, from this place you can see all the landscape and the mountains surrounding Baños de Agua Santa. In this place there is the "Swing at the End of the World", placed in the Tree House, besides this activity there is currently a varied tourist offer in the place, you can do canopies, walks around the place, if you are risky you can try your balance in some clubs prepared for that or enjoy a delicious hot chocolate or other delicacies offered by the restaurant of the place. The site allows adventurers to enjoy unforgettable, incredible and direct views of the crater, cone, skirts, gorges, gorges and behavior of the Tungurahua volcano. This is because it is located just in front of the western flank of the colossus, on a small hill, just 2.5 kilometers in a straight line from the top of the massif. The audacious tourists who dare to climb and rock on the rock ensure that they enjoy a unique and amazing experience each time they swing over the deep ravine. "I think I'll never forget the feeling of being flying over the mountain that is experienced when climbing this seesaw," says one of the tourists who visit the place. It is also an ideal place for photos and meditation. Similarly, who dares to climb one of the 2 floors of the tiny house, take the opportunity to take pictures, contemplate the panorama, meditate or just feel the cold wind in the face, because at this height the air runs with force and at temperatures of 5 and 9 degrees Celsius. "When the day is clear, you can appreciate the volcano in all its splendor. With the help of binoculars you can even see the interior of the crater, since viewed from this angle the top of the massif has a slight inclination that allows you to look and portray its interior ". Even on cloudy days the visit to the place is possible, since there is an ecological walk that surrounds the property, by which you can walk guided by a rope enabled for this purpose. Through tours the same ones that leave every day at 10h00, 12h00 and 16h00, those that have a cost of $ 6 and $ 10 dollars. Via bus (time: 05h45 / 11H00 / 14h00 / 16h00). And also renting the famous quad bikes or motorcycles, the cost for rent varies from 15 to 20 USD (depends on the power of the square that you are renting). Getting to Casa del Arbol from Baños Ecuador takes approximately 45 minutes. What should you take to the Tree House? 1.50 dollars for adults or 1.00 dollars for children, is the cost of the entrance to the Tree House.